The Penderwick sisters busily discover the summertime magic of Arundel estate’s sprawling gardens, treasure-filled attic, tame rabbits, and the cook who makes the best gingerbread in Massachusetts. Best of all is Jeffrey Tifton, son of Arundel’s owner, the perfect companion for their adventures. Icy-hearted Mrs. Tifton is less pleased with the Penderwicks than Jeffrey, and warns the new friends to stay out of trouble. Is that any fun? For sure the summer will be unforgettable. This book has been on my to be read pile since before we moved. I received it in a book swap for favourite young adult book. The book I sent in exchange was Jack Templar Monster Hunter by Jeff Gunhus, because I always recommend his work when and where I can as I love it. I feel after finally reading this that it was a good exchange. 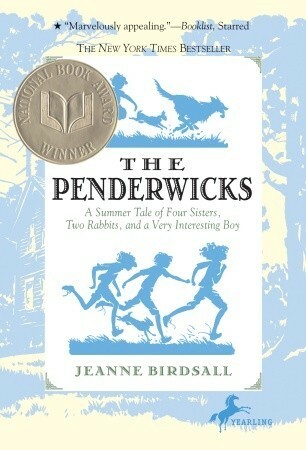 This was a fun book, a family vacation can lead to tons of adventures as a child. I remember the countless antics I got up to as a kid exploring on vacation and meeting other kids. You know back in the days when our parents just set us loose with a vague time to come home when the streetlights came on. Batty was by far my favourite character, on the inside I am secretly a four year old. MAYBE five on a really grown up day. I may not wear wings everyday but I do regularly dress up like a fantasy creature. Plus given the option I will ALWAYS wear a tutu. I have a large collection of them, it's getting a bit insane. This is a book that I will be passing along to the kidlets to let them enjoy it as well. Ace might be a little old but Cat is quickly becoming an avid reader and I think that she will enjoy it. I love that you love tutus! :D I love them too, although I don't own any! Thanks so much for linking up to The Monday Review!